Luke Rafferty works in online marketing by day and contemplates the rise and fall of Aaron Sorkin by night. He graduated from an accredited socialist commune called Hampshire College with a concentration in Political Science and History. Before he figured out you can buy things with money, he did two AmeriCorps service years, which included firefighting in California and community planning in Vermont. The mechanics of government have been surprisingly generous to progressives recently. The Supreme Court has advanced our social agenda, President Obama has managed to push forward with his own goals (even if his methods sometimes reek of executive overreach) and Donald Trump has imploded any gravitas Republicans might have been accumulating in their own primary process. If not for one significant budget decision being made in a congressional subcommittee, I could sit back, smirk about social and political progress, and studiously ignore the nagging doubts in my nervous heart. In the proposed budget for the 2016 fiscal year, a House Appropriations subcommittee dramatically reduced the budget for the Corporation for National and Community Service (CNCS), and has eliminated the AmeriCorps National Civilian Community Corps (NCCC). If you’re like most Americans, you’ve never heard of CNCS or AmeriCorps NCCC, or maybe you had that one cousin who didn’t know what to do after college and ended up doing an AmeriCorps program helping a non-profit in Wyoming. Either way, I’m here to tell you that not only should CNCS have its budget restored, but its budget should be grown, year over year, until national service finally addresses all of the problems in this country. Liberals like myself defend the idea of big government because of one simple fact: we can get a lot more done when we work together than when we act individually. That notion is at the very core of my political identity. If there were any doubts in my mind that collective action holds more promise than the efforts of a single person, my time in NCCC working on a team fighting literal fires obliterated those doubts. The government we have may be an inefficient perpetual motion machine of dysfunction, but it is not a parasite. Its failures exist because while this country may be rich, it is not united. We do not act as a team. Our fractious political parties are just cartoonishly magnified echoes of the disdain we feel for our neighbors. Maybe if we all just spent a little more time building houses with each other, we could put our more trivial differences to bed and, more importantly, actually resolve our most corrosive disagreements. When it comes to my own volunteer service, there are two things that I am most thankful for; the service I was able to do, and the relationships I was able to form as a result. A little history. 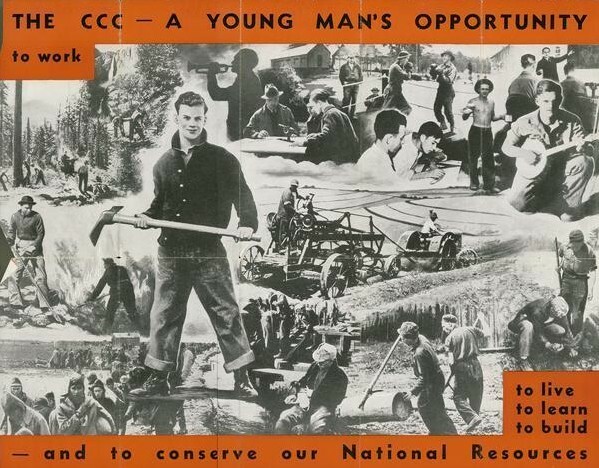 You may be familiar with the Civilian Conservation Corps (CCC) founded to put young Americans to work during the depths of the Great Depression. Make-work has become a dirty word, but at the time the CCC was a pivotal program that pumped money into the economy, put people to work, and created some of our county’s most beautiful trail systems. Inspired by the Civilian Conservation Corps, another organization with the same initials was born in 1976, the California Conservation Corps. In this case there was a youth (late teen to mid-twenties) focus to the make-work scheme. The federal government came around to the idea in 1993 with a national version of the California program, the NCCC. For twenty years our national government has brought together young adults aged 18-24 and put them to work. The CNCS costs the government about a billion dollars annually (and I’m here to distract you from thinking of how many Hellfire missiles you could buy with that kind of scratch). NCCC only costs about $30 million a year, is the primary reason I am who I am today, and has shaped countless other lives during its run. And now we arrive at the crux of the issue. Do you think that the federal government should be in this business? Is this a good use of our money? Do you want your couple of pennies back instead? Or do you wish you or your children had access to this program? I would argue that NCCC does more than just provide jobs to the most vulnerable working demographic. In a very small, but very important way, it does two things for its participants. First, you’re forced to recognize that people who come from different walks of life have the same rich inner life that you have. Second, you realize that every community has work to be done, and people who are ready to stand up and do it – even if there are never enough of those people, and never enough money. These are things that only the most adept 18-year-olds people know. As a 23-year-old with an expensive liberal arts degree I knew those things in theory, but not in practice. What do an athletic bro from North Carolina, a blue-collar Wisconsin dude, and a college graduate from the DC suburbs all have in common? They came together, put aside their myriad differences, and cut fireline with me in hellish California drought conditions. And that was just my own experience. It doesn’t matter if you just graduated high school or college. If you were born with a silver spoon in your mouth or were born into urban violence. Your gender didn’t matter. Your race didn’t matter. If you worked hard, had my back, and left it all on the field, you were in my brother. And that mattered when we sat around and got into serious conversations about faith, or feminism, or love. Every cliché you hear about people with different life experiences being able to offer insights that you would never think of, they’re true. I’ve never served this country in its military, but I have lived a lesser form of the camaraderie that you hear about. I was lucky that my team became so tightly knit, but even if you subtract the social benefit, and the lessons my teammates taught me, you would still be left with all the good we did up and down California that year. And if you’re unmoved by my sentimentality and still think we should cut the program, I hope this is where I can bring you back around. In NCCC you’re still a government employee, so accounting for every second of your time is mandatory. It’s also a program that fears (rightly it seems) losing its funding, so the accounting was doubly important. So we accounted for all of our hours served, how many nails we hammered, and how many miles of fireline cut. It was a pain, but the numbers are staggering. How many hours of service do you think each member is expected to work in exchange for $4000 in living allowance, and the Pell Grant they get? Do you have a number in your head? 1700 hours, including 80 hours served doing self-directed work in local communities. If you don’t think that’s a bargain at twice the price, you haven’t seen any CEO salary numbers in a while. My team helped migrant workers build their own new homes so that they could move out of shantytowns. We helped prepare an Episcopal summer camp that gives kids with transplanted organs and chronic illnesses a chance to feel normal again. And we helped the firefighters in the Plumas National Forest get ready for another fire season, including participating in controlled burns, to revitalize the ecosystem and rob would be wildfires of potential fuel. It’s the sort of work that is meant to make fighting actual wildfires just a little bit easier. A woman gave me cookies because she knew that her house was that much safer with the forest around it properly maintained. That memory and so many others are precious to me. A lot of my friends were starting their careers, or continuing their education, but I was giving something back to my community. Not the community that raised me in New Jersey, or educated me in western Massachusetts, but a community of people I didn’t know, and would never have met otherwise, of strangers who I came to respect and to love. That empathy has served me well in the years since NCCC, and is a something that desperately needs to be injected into our political dialogue. I keep coming back to the personal improvement NCCC allowed me to pursue through the friendships I made there, but the impact on our American community is what ought to convince lawmakers of every stripe that it’s a program worth keeping. Something the New York Times editorial pages came around to over a year ago. It’s almost funny how the Times‘ indignation over the lack of additional funding for the program looks, now that it’s staring down the prospect of final elimination. There should be a consensus on allowing young adults to give their time and energy towards building better communities and better selves, but it’s not so. While Republicans and Democrats pay lip service to the importance of the program, nobody is willing to step up, articulate its benefits and take a hard line against budget-slashing politicians. It’s a clear win for them, with nobody in Washington prepared to expend political capital to defend a staggeringly beneficial program, albeit a non-vital one. AmeriCorps is the sort of program that benefits all parties involved, at a shockingly low cost, while being technically expendable. This comes down to your fundamental understanding of government. Should it bring us together to preserve our national interests, our social integrity, and our shared infrastructure? Or should it just exist to collect taxes and distribute corporate subsidies? I obviously believe it’s the former, and programs like AmeriCorps, which bind us to one another more closely, are a critical, overlooked function of government and component of our national identity. Well said and beautifully written!